Blends With: Pine, Cedarwood, Benzoin, Lavender, Patchouli, Spruce and Rosemary. Product Abstract: The needles of the Balsam Fir are from 3/4 to 1-1/4 inches long with two white stripes running down the underside of each needle. 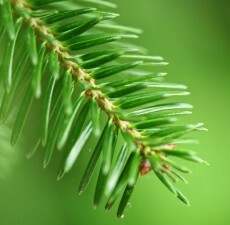 Also known as Blistering Pine, the oil is commonly used in air fresheners and household cleansers. Long before the advent of chewing gum, the gum was sold as a breath-freshener, and it was used medicinally on the battle field during the American Civil War. Abies balsamea / SD-O / Canada / Needle Botanical Name: Abies balsamea Main Constituents: α,β-pinene: 52.2% l-bornyl acetate: 7.8% Plant Part: Needles Origin: Canada Processing Method: Steam Distilled Description / Color / Consistency: A medium, clear, colourless to pale yellow liquid. Aromatic Summary / Note / Strength of Aroma: A middle note of strong aroma, Fir Balsam Essential Oil has the crisp, clean scent of fir balsam needles. Blends With: Pine, Cedarwood, Benzoin, Lavender, Patchouli, Spruce and Rosemary. Product Abstract: The needles of the Balsam Fir are from 3/4 to 1-1/4 inches long with two white stripes running down the underside of each needle. Also known as Blistering Pine, the oil is commonly used in air fresheners and household cleansers. Long before the advent of chewing gum, the gum was sold as a breath-freshener, and it was used medicinally on the battle field during the American Civil War. Cautions: Dilute very well before use; for external use only. May cause skin irritation in some individuals; a skin test is recommended prior to use. Contact with eyes should be avoided.